Background: The Roll Back Malaria (RBM) Partnership converged in Abuja in 2000. In 2005, Nigeria adopted artemisinin-based combination therapies (ACTs) as first-line therapy for uncomplicated malaria. It was determined that by 2010, 80% of persons with malaria would be effectively treated. Objectives: To describe household practices for malaria treatment in Benin City; to explore demographic characteristics that may influence use of ACTs. Materials and Methods: Multistage sampling technique was used to select households from each of the three local government areas in Benin City. Adult respondents were interviewed. Household reference persons (HRPs) were defined by International Labour Organization categories. Data were collected between December 2009 and February 2010 and were analyzed using Statistical Package for the Social Sciences Version 16.0, at a significance level of P < 0.05 (2-tailed). 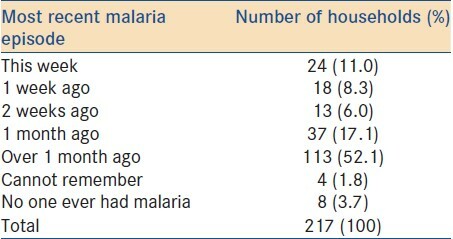 Results: Of the 240 households selected, 217 were accessible, and respondents from 90% of these recalled the most recent episode (s) of malaria. One-third of malaria episodes had occurred in children younger than 5 years. ACTs were used in 4.9% of households; sulfadoxine-pyrimethamine was the chief non-ACT antimalarial, followed by artemisinin monotherapies. Patent medicine stores were the most common sources of antimalarial medicines (38.2%), followed by private hospitals (20.3%) and private pharmacies (10.6%). Only 8.3% of households got their medicines from government hospitals. Having a HRP in managerial or professional categories was associated with a 6 times higher odds of using ACTs, compared to other occupational categories [odds ratio (OR) 5.8; confidence interval (CI) 1.470-20.758, P = 0.016]. Fathers' tertiary or higher education was significantly associated with ACT use, but not mothers' (OR 0.054, CI 0.006-0.510; P = 0.011 and OR 0.905, CI 0.195-4.198; P = 0.898, respectively). Conclusion: Ten years after the historic Abuja meeting, only 5% of households in Benin City used ACTs for the treatment of malaria, sourcing medicines chiefly from patent medicine stores and private hospitals. Fathers' level of education was significantly associated with ACT use. Interventions to eliminate malaria from Nigeria should mainstream the men folk and health care providers outside government hospitals, in line with the Nigerian reality. Fond: Le partenariat Roll Back Malaria (RBM) ont convergé à Abuja en 2000. En 2005, le Nigeria a adopté thérapies de combinaison à base d'artémisinine (Act) comme traitement de première intention contre le paludisme sans complications. Il a été déterminé que d'ici 2010, 80 % des personnes atteintes de paludisme serait effectivement traité. Objectifs: Pour décrire les pratiques domestiques pour le traitement du paludisme à Benin City ; pour explorer les données démographiques qui peuvent influencer l'utilisation des Act. Matériel et Méthodes: Technique d'échantillonnage Multistage a été utilisé pour sélectionner des ménages dans chacune des trois zones de gouvernement local à Benin City. Répondants adultes ont été interrogés. Personnes de référence domestique (HRPs) ont été définies par catégories de l'Organisation internationale du travail. Données ont été recueillies entre décembre 2009 et février 2010 et ont été analysées à l'aide de logiciel de statistiques pour la Sciences sociales Version 16.0, à un niveau de signification de P < 0,05 (2 à queue). Résultats: De la 240 ménages sélectionnés, 217 étaient accessibles, et 90 % de ces répondants a rappelé les dernières épisodes de paludisme. Un tiers des épisodes de paludisme chez les enfants âgés de moins de 5 ans avait eu lieu. Actes servaient à 4,9 % des ménages ; sulfadoxine-pyriméthamine était le chef antipaludique de non-agir, suivie de l'artémisinine en monothérapie. Magasins de médicaments brevetés ont été les sources les plus courantes de médicaments antipaludiques (38,2 %), suivis des hôpitaux privés (20,3 %) et les pharmacies privées (10,6 %). Seulement 8,3 % des ménages obtenu leurs médicaments des hôpitaux publics. Avec un HRP dans des catégories de cadres ou professionnels a été associée à un 6 fois plus de chances d'utiliser les lois, par rapport aux autres catégories professionnelles [rapport de cotes (RC) 5,8 ; intervalle de confiance (IC) 1,470 - 20.758, P = 0,016]. Tertiaire ou l'enseignement supérieur des pères était significativement associée à la Loi sur l'utilisation, mais pas des mères (ou 0,054, CI 0,006 - 0,510 ; P = 0,011 et ou 0.905, CI 0,195-4.198 ; P = 0,898, respectivement). Conclusion: Dix ans après la réunion d'Abuja historique, seulement 5 % des ménages à Benin City utilisé agit pour le traitement du paludisme, approvisionnement en médicaments principalement de médicaments brevetés magasins et hôpitaux privés. Niveau des pères de l'éducation était significativement associée à la Loi sur l'utilisation. Interventions visant à éliminer le paludisme du Nigeria doit intégrer les hommes et les dispensateurs de soins en dehors des hôpitaux publics, conforme à la réalité nigériane. Household surveys evaluating the uptake of interventions to eliminate malaria do not usually include questions on malaria treatment. This study was undertaken to evaluate the success (or otherwise) of the National Malaria Control Program's scale up of interventions to improve malaria therapy, from the perspective of household practices in Benin City. The overall objective was to provide an overview of population demographics, to assess practices undertaken for the treatment of malaria in households, and to explore what demographic factors (if any) play a role in the uptake of ACTs as therapy for malaria. On the basis of anecdotal evidence, our a priori hypotheses were (i) most households in Benin City may not be using ACTs for the treatment of malaria and (ii) households with HRPs in higher educational and occupational categories may be more likely to use ACTs. A quantitative, cross-sectional design was used. Epi Info software for population survey was used to calculate the required sample size. The estimated number of households was 159 at 99% confidence level. On the basis of published work on nonresponse rates, , and choosing to adopt a worst case scenario, an additional 50% allowance was allowed for anticipated non-consents, giving a sample size that was rounded up to 240 households. A multistage sampling technique was used. Lists of all households in Benin City, grouped according to their respective EAs were obtained from the State Office of the National Bureau of Statistics. In each LGA, 4 EAs were selected by simple random sampling. A sampling frame was then obtained by listing all households in the selected EAs, for each LGA. In order to select 80 households from this sampling frame, 80 random numbers were electronically generated  per LGA, and marked off on the respective household lists. Questionnaires were both pretested and pilot tested using two different convenience samples of households. Adults who were competent and willing to give informed consent were interviewed in the selected households. Consent was formalized by participants signing or thumb printing on consent forms. Information obtained from respondents included household demographics such as numbers of persons living in the households, ages of household members, and occupations of parents/guardians. Respondents were also requested to recall the most recent episode of malaria in any household member, how long ago the malaria episode had occurred, and the age(s) of household members who had been presumed to have malaria. Additionally, they provided information regarding whether or not such malaria episodes had been treated, what medicines had been used, and how/where those medicines were sourced. We recorded malaria treatments as "uncertain" if there was any doubt as to what category of antimalarial medicine had been given. Ethical clearance was obtained from the University of Benin Teaching Hospital Research and Ethics Committee, and the University of Liverpool Committee on Research Ethics, prior to data collection, the latter because this study was undertaken in part-fulfillment of the requirements for the award of a Master of Public Health degree of the University of Liverpool. The occupations of working adults in each household were used to determine who the household reference persons (HRPs) should be. In households where more than one parent (or guardian) was employed, the person whose occupation was judged to provide a higher income was taken as the HRP. The occupational status of HRPs was further classified using the International Labour Organization (ILO) occupational classification,  with additional categories added to accommodate retirees and unemployed persons. 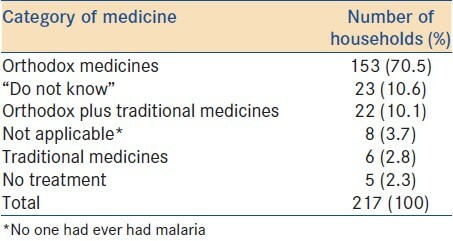 All medicines reported to have been used for the treatment of malaria were grouped to determine what proportions each category of medicines contributed. Data were analyzed using the Statistical Package for the Social Sciences (SPSS) version 16.0; graphs were redrawn using Microsoft Excel software. Where expected count in any cell was less than 5, Fisher's exact test was used. A 2-tailed P value less than 0.05 was considered statistically significant. Significant associations between categorical variables were validated using appropriate logistic regression models. A total of 217 households were surveyed: In 19 of the 240 households selected into the sample, no adult was available to provide informed consent after repeated visits. These households were, therefore, excluded. Consent was denied in four of the remaining households (non-consent rate of 1.7%). 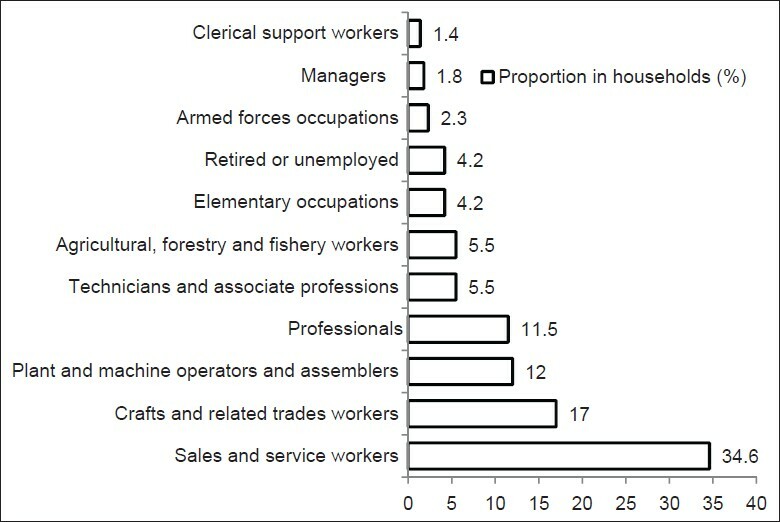 [Figure 1] is an illustration of the distribution of HRPs according to occupational categories: Sales and service workers were in the majority (34.6%). Mothers were on the whole less educated than fathers: 10 out of 218 mothers (4.6%) versus 3 out of 201 fathers (1.5%) had no formal education; 42 mothers (19.3%) versus 47 fathers (23.4%) had attained tertiary education [Figure 2]. 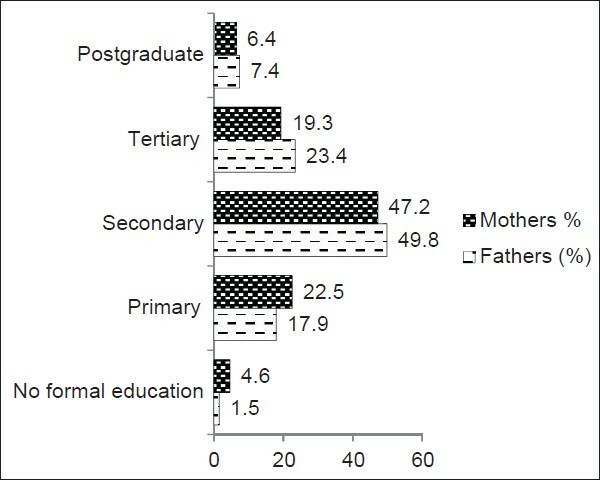 The difference in educational levels between fathers and mothers in Benin City was, however, not statistically significant (Chi-square statistic 5.44, df 4; P = 0.24). Over 90% of respondents could recall the most recent episode of malaria that had occurred in their respective households. In 8 (3.7%) households no one had ever suffered from malaria [Table 1]. A third of malaria episodes had occurred in children younger than X5 years old [Figure 3]. Orthodox medicines were used for the treatment of malaria in 154 (70.5%) households. One in ten households used traditional medicines for the treatment of malaria, in combination with orthodox medicines; 6 (2.8%) used traditional medicines alone [Table 2]. 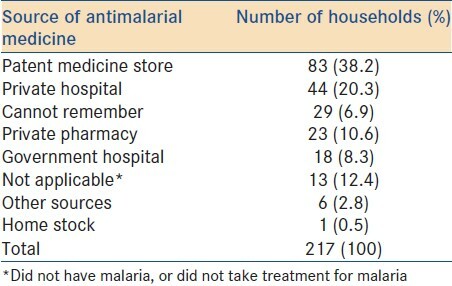 ACTs were used for the treatment of malaria in 10 (4.9%) households [Table 3]. No household member had received treatment from a Community Medicine Distributor (CMD). Of all the medicines that were used for the treatment of malaria, paracetamol and other analgesics comprised the highest proportions (21.6%), followed by vitamins (as single or multivitamin preparations). 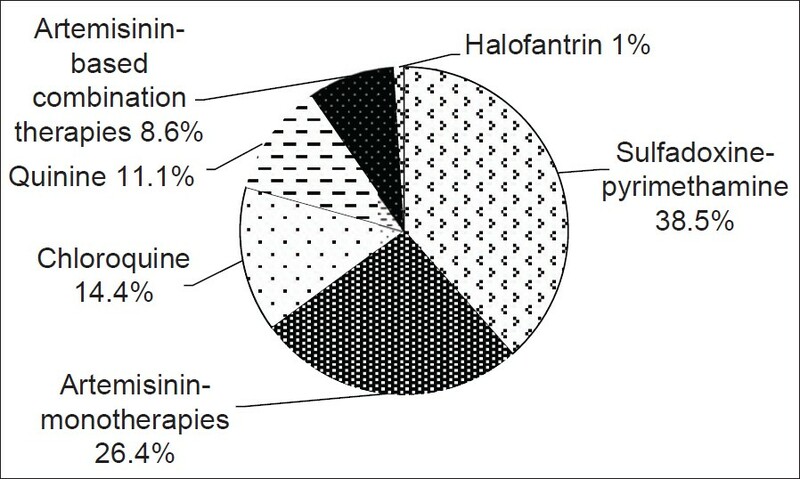 Sulfadoxine-pyrimethamine was the most commonly used antimalarial medicine, with artemisinin monotherapies coming next [Figure 4]. ACTs accounted for 3.6% of all medicines used, behind antibiotics, traditional medicines, chloroquine and quinine. As a proportion of anti-malarial medicines, sulfadoxine-pyrimethamine accounted for nearly 40%, artemisinin monotherapies 24.6%; chloroquine and quinine jointly comprised over 25%. 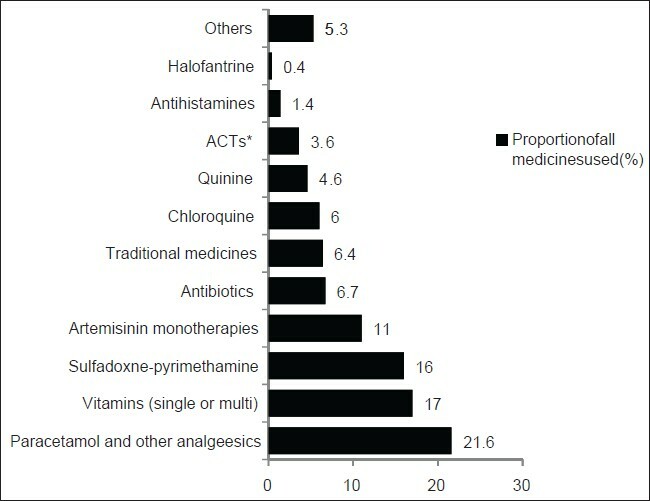 ACTs accounted for 8.6% of all antimalarial medicines [Figure 5]. Patent medicine stores were the most frequently accessed sources for medicines used for the treatment of malaria; the least accessed were government hospitals [Table 4]. There was a statistically significant association between fathers' attainment of tertiary (or higher) education and use of ACTs, when compared to fathers who had not attained this level of education (OR 0.054, CI 0.006-0.510; P = 0.011). This association was not significant for mothers' attainment of tertiary (or higher) education (OR 0.905, CI 0.195-4.198; P = 0.898; [Table 5]). 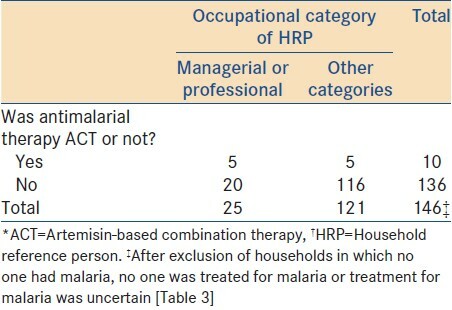 Households with HRPs in occupational categories other than "managerial" or "professional" were 6 times more likely to use non-artemisinin antimalarial therapies compared to households in which the HRP's were either professionals or in the managerial category (OR 5.8; CI 1.470-20.758, P = 0.016) [Table 6]. It is noteworthy that illness presumed to be malaria was more often treated with medicines without activity against the causative plasmodium species, such as paracetamol and other analgesics, as well as vitamin preparations, rather than antimalarial medicines. Another point of note in the relationship between parents'/guardians' education and ACT use is that, contrary to our a priori hypothesis, higher level education (in fathers) was associated with lower odds of household members getting ACTs for the treatment of malaria. The confidence interval associated with this odds ratio is wide, suggesting variability. Although we are cautious in interpreting this association, it warrants further thought, especially as the study was well powered and the values are not close to unity. There is evidence that patent medicine vendors are the chief sources of malaria treatment in Nigeria. , Our study provides further evidence in this regard, whereas only 8.3% of households obtained antimalarial medicines from government hospitals, nearly 40% obtained their medicines from patent medicine stores. In a national study that included states from eastern, northern, and western Nigeria, sulfadoxine-pyrimethamine was the most frequently stocked antimalarial medicine in patent medicine shops, and less than half of patent medicine vendors were aware of the policy change requiring ACTs to be used as first line therapy for uncomplicated malaria. The preference for patent medicine vendors rather than hospitals (government or privately owned) would be multifactorial, poverty being one of them. Poverty is perpetuated by malaria and vice versa. , This relationship can be likened to the proverbial one between the chicken and egg, which came first? Efforts to eliminate malaria from Nigeria must integrate the many-faceted effects of poverty on Nigerians' living conditions and treatment seeking behaviors/choices. The role of providers of health care in the informal sector must not be ignored. Although there have been efforts to train patent medicine vendors using strategies for behavioral change,  the magnitude of the challenge deserves more aggressive, focused, and more far-reaching interventions. Community uptake of ACTs appears to be low because current interventions to shore up the uptake of ACTs appear to be overly focused on government owned health facilities, which are not the preferred sources of care for the majority of community members. The reality of the Nigerian situation therefore requires that more attention be given to nongovernment providers of health care, including the informal sector. It is not clear how this will be achieved, especially as interventions are mostly donor-driven. Social marketing to redirect interventions for overall public good is needful and hopefully should be successful. The predominance of children aged less than 5 years old in episodes of malaria in households is in keeping with national and regional statistics. , The details of practices undertaken for the treatment of malaria in this age group in households in Benin City are beyond the scope of this paper and will be reported differently. Ten years after the Abuja Targets were set, and 5 years after the national policy change to ACTs for the treatment of uncomplicated malaria in Nigeria, only 5% of households in Benin City used ACTs for the treatment of malaria. In households in Benin City, mothers' higher levels of education (tertiary and above) was not significantly associated with the use of ACTs. Contrariwise, fathers' higher level of education (tertiary or above) was associated with less use of ACTs. Both of these findings negate our initial hypothesis regarding level of education and ACT use. In line with our a priori hypothesis, occupational status is a key determinant of ACT use. Patent medicine vendors, private hospitals, and pharmacies were the most accessed sources of medicines for the treatment of malaria and thus cannot be ignored if the targets for effective malaria treatment in Nigeria are to be achieved. The research question that this study sought to answer is relevant to the current targets of the RBM Partnership in Nigeria. Using randomly selected households assures that the findings are generalizable to the population from which the sample was drawn (external validity). Internal validity is assured as questionnaires were administered by competent personnel; data were also competently managed and analyzed to reach the stated conclusions. We relied on self-reported febrile illnesses, presumed to be malaria. As respondents were required to recall details of the most recent episodes of malaria, the likelihood of recall bias cannot be excluded. The LGAs from which all households were selected were predominantly urban. The findings may not be generalizable to rural populations. 1. Lines J, Whitty, CJ, Hanson K. Prospects for eradication and elimination of malaria: A technical briefing for DFID. London: DFID Health Resource Centre; 2007. Available from: http://hwww.dfidhealthrc.org/publications/atm/Elimination%20and%20eradication%2 0for%20DFID%20final%2013%2012%2007%20_2_.pdf [Last cited on 2013 Mar 2]. 2. World Health Organization. Global malaria control and elimination: Report of a technical review. Geneva: WHO Press; 2008. Available from: http://apps.who.int/malaria/docs/elimination/MalariaControlEliminationMeeting.pdf [Last cited on 2013 Mar 2]. 3. Roll Back Malaria. The global malaria action plan. The Roll Back Malaria Partnership; 2008. Available from: http://www.rbm.who.int/gmap/gmap.pdf [Last cited on 2013 Feb 13]. 4. USAID. The President′s Malaria Initiative. Sustaining momentum against malaria: saving lives in Africa. Fourth annual report. Centre for Disease Control; 2010. Available from: http://www.pmi.gov/resources/reports/pmi_annual_report10.pdf [Last cited on 2013 Mar 3]. 5. World Health Organization. World health statistics 2011. Geneva: WHO Press; 2011. Available from: http://www.who.int/whosis/whostat/EN_WHS2011_Full.pdf [Last cited on 2013 Jan 22]. 6. Federal Ministry of Health. National malaria control programme, Abuja. A 5-year strategic plan: 2006-2010. A road map for impact on malaria in Nigeria. 2005. Available from: http://www.rollbackmalaria.org/countryaction/nsp/nigeria.pdf [Last cited on 2009 Oct 4]. 7. Federal Ministry of Health. National anti-malarial treatment policy 2005. Available from: http://nmcpnigeria.org/f/case-management/2005-National%20Anti-malaria%20Treatment%20Policy-Feb05%5BFinal%5D.pdf [Last cited 2009 Nov 18]. 8. World Health Organization. Guidelines for the treatment of malaria. Geneva: WHO Press; 2006. Available from: http://whqlibdoc.who.int/publications/2010/9789241547925_eng.pdf [Last cited on 2013 Mar 2]. 9. Mutabingwa TK. Artemisinin-based combination therapies (ACTs): Best hope for malaria treatment but inaccessible to the needy! Acta Trop 2005;95:305-15. 10. World Health Organization. Malaria case management. Geneva: WHO Press; 2009. Available from: http://whqlibdoc.who.int/publications/2009/9789241598088_eng.pdf [Last cited on 2013 Mar 2]. 11. Bell D, Winstanley P. Current issues in the treatment of uncomplicated malaria in Africa. Br Med Bull 2004;71:29-43. 12. The World Bank. Intensifying the fight against malaria: The World Bank′s booster program for malaria control in Africa/AFTHD Africa Region. Available from: http://siteresources.worldbank.org/INTAFRBOOPRO/Resources/Book_Intensifying _the_Fight_Against_Malaria.pdf [Last cited on 2013 Feb 7]. 13. Uzochukwu BS, Ezeoke OP, Emma-Ukaegbu U, Onwujekwe OE, Sibeudu FT. Malaria treatment services in Nigeria: A review. Niger Med J 2010;51:114-9. 14. Bloland P. Drug resistance in malaria. Geneva: WHO Press; 2001. Available from: http://www.who.int/csr/resources/publications/drugresist/malaria.pdf [Last cited on 2013 Mar 2]. 15. National Malaria Control Program. Technical Report of: Drug efficacy studies. 2010. Available from: http://www.nmcpnigeria.org/f/case-management/2009%20-%202010%20Drug%20Therapeutic%20Efficacy%20Test%20Report.pdf?PHPSESSID=0ce9682fb1607585796c701f804e8d20 [Last cited on 2013 Feb 5]. 16. White NJ. Malaria-time to act. N Engl J Med 2006;355:1956-7. 17. World Health Organization. World health statistics 2009. Geneva: WHO Press; 2009. Availablfrom: http://www.who.int/whosis/whostat/EN_WHS09_Full.pdf [Last cited on 2009 Dec]. 18. Saulo EC, Forsberg BC, Premji Z, Montgomery SM, Björkman A. Willingness and ability to pay for artemisinin-based combination therapy in rural Tanzania. Malar J 2008;7:227. 19. Chuma J, Okungu V, Molyneux C. Barriers to prompt and effective malaria treatment among the poorest population in Kenya. Malar J 2010;9:144. 20. Wagbatsoma VA, Aigbe EE. ITN utilization among pregnant women attending ANC in Etsako West LGA, Edo State, Nigeria. Niger J Clin Pract 2010;13:144-8. 21. Jombo GT, Mbaawuaga EM, Denen AP, Alao OO, Peters EJ, Dauda MA, et al. Choices of drugs for self-treatment of malaria among adult women in a Nigerian city: Implications for the success of the ongoing ′roll back′ malaria programme. J Microbiol Antimicrob 2010;2:57-63. 22. Federal Ministry of Health. National strategies and guidelines for home and community management of malaria. 2005. Available from: http://nmcpnigeria.org/f/case-management/hmm/National Guidelines %26 Strategy For HMM Dec 05.pdf [Last cited on 2013 Feb 13]. 23. Ajayi IO, Falade CO, Bamgboye EA, Oduola AM, Kale OO. Assessment of atreatment guideline to improve home management of malaria in children in rural south-west Nigeria. Malar J 2008;7:24. 24. Ajayi IO, Browne EN, Bateganya F, Yar D, Happi C, Falade CO, et al. 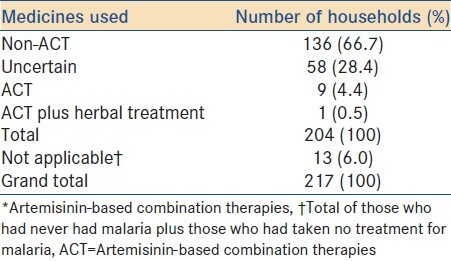 Effectiveness of artemisinin-based combination therapy used in the context of home management of malaria: A report from three study sites in sub-Saharan Africa. Malar J 2008;7:190. 25. World Health Organization. World malaria report 2008. Geneva: WHO Press; 2008. 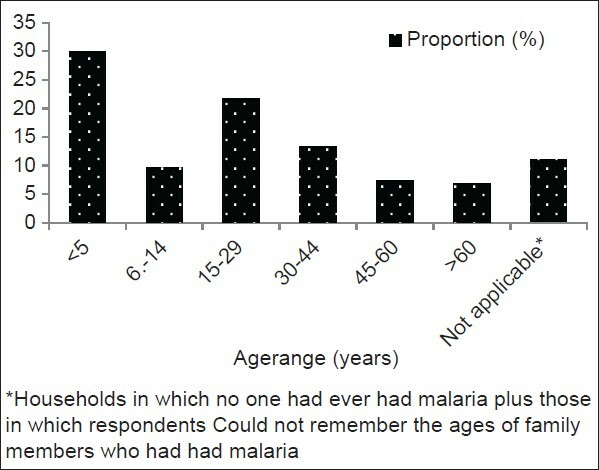 Available from: http://apps.who.int/malaria/wmr2008/malaria2008.pdf [Last cited on 2009 Nov 20]. 26. Brinkhoff T. City population. Nigeria. 2009. Available from: http://www.citypopulation.de/Nigeria.html [Last cited on 2010 Feb 14]. 27. Epi Info version 6. Statcalc. Population survey for descriptive study using random (not cluster) sampling. 1993. 28. Groves RM. Non-response rates and non-response bias in household surveys. Available from: http://www.dc-aapor.org/documents/NRW07_Nonresponse Ratesand Biasin Household Surveys Groves.pdf [Last cited on 2013 Feb 25]. 29. Atrostic BK, Bates N, Burt G, Siberstein A. Non-response in US Government household surveys: Consistent measures, recent trends, and new insights. J Off Stat 2001;17:209-26. 30. National Bureau of Statistics. General household survey/national agricultural sample census. General household listing and masters form. Nigeria. 2007. 31. StatTrek.com. Random number generator. Available from: http://stattrek.com/Tables/Random.aspx [Last cited 2010 Feb 13]. 32. Office for National Statistics. The national statistics socio-economic classification. Available from: http://www.statistics.gov.uk/methods_quality/ns_sec/downloads/NS-SEC_User_2005.pdf [Last cited on 2010 Jan 15]. 33. International Labour Organization. Report of meeting of experts on labour statistics; Geneva, 3-6 December 2007. 2008. Available from: http://www.ilo.org/wcmsp5/groups/public/---ed_norm/---relconf/documents/meetingdocument/wcms_091170.pdf [Last cited on 2010 May 18]. 34. Field A. Discovering Statistics using SPSS. 3 rd ed. London: Sage; 2009. 35. Kouyaté B, Sie A, Yé M, De Allegri M, Müller O. The great failure of malaria control in Africa: A district perspective from Burkina Faso. PLoS Med 2007;4:e127. 36. Lawford H, Zurovac D, O′Reilly L, Hoibak S, Cowley A, Munga S, et al. Adherence to prescribed artemisinin-based combination therapy in Garissa and Bunyala districts, Kenya. Malar J 2011;10:281. 37. Njogu J, Akhwale W, Hamer DH, Zurovac D. Health facility and health worker readiness to deliver new national treatment policy for malaria in Kenya. East Afr Med J 2008;85:213-21. 38. Oreagba IA, Olayemi SO, Omotosho SK, Onajole AT, Awodele O, Akinyede AA. The use of artemisinin-based combination therapies (ACTs) in public secondary health facilities in Lagos, Nigeria. Niger Postgrad Med J 2008;15:94-100. 39. World Health Organization. Marketing of oral artemisinin based monotherapy medicines. Available from: http://www.who.int/malaria/marketing_of_oral_artemisinin_monotherapies/en/index.html [Last cited on 2013 Feb 16]. 40. Bosman A. The threat of oral artemisinin-based monotherapies. 2010. Available from: http://www.mmv.org/sites/default/files/uploads/docs/artemisinin/2010_Madagascar/Threat_of_Oral_Artemisinin-Based_Monotherapies.pdf [Last cited on 2013 Feb 16]. 41. Tougher S, Ye Y, Amuasi JH, Kourgueni IA, Thomson R, Goodman C, et al. Effect of the Affordable Medicines Facility--malaria (AMFm) on the availability, price, and market share of quality-assured artemisinin-based combination therapies in seven countries: A before-and-after analysis of outlet survey data. Lancet 2012;380:1916-26. 42. British Council Nigeria. Gender in Nigeria Report 2012. Improving the lives of girls and women in Nigeria. Available from: http://www.dfid.gov.uk/Documents/publications1/Gender-Nigeria2012.pdf [Last cited on 2013 Feb 6]. 43. Kenya NGO′s Alliance Against Malaria. Community ownership of interventions. Available from: http://www.kenaam.org/index.php?option=com_content and view=article and id=237:community-ownership-of-interventions- and catid=44:stories-from-the-field and Itemid=209 [Last cited on 2012 Jan 22]. 44. Atkinson JA, Fitzgerald L, Toaliu H, Taleo G, Tynan A, Whittaker M, et al. Community participation for malaria elimination in Tafea Province, Vanuatu: Part I. Maintaining motivation for prevention practices in the context of disappearing disease. Malar J 2010,9:93. 45. Braveman P. Measuring socioeconomic status/position (SES) in health research: We can do better. 2010. Available from: http://www.iom.edu/~/media/Files/Activity%20Files/Nutrition/FoodInsecurityandObesity/Braveman.pdf [Last cited on 2013 Jan 30]. 46. Oladepo O, Salami KK, Adeoye BW, Oshiname F, Ofi B, Oladepo M, et al. Malaria treatment and policy in three regions in Nigeria: The role of patent medicine vendors. Future Health Systems Innovations for Equity, Working Paper. 2007. Available from: http://www.dfid.gov.uk/r4d/PDF/Outputs/FutureHealth_pdf [Last cited on 2013 Feb 6]. 47. Uzochukwu BS, Onwujekwe OE. Socio-economic differences and health seeking behaviour for the diagnosis and treatment of malaria: A case study of four local government areas operating the Bamako Initiative programme in south-east Nigeria. Int J Equity Health 2004;3:6. 48. Brentlinger PE. Health, human rights, and malaria control: Historical background and current challenges. Health Hum Rights 2006;9:10-38. 49. Aniebue PN, Aguwa EN, Obi EI. Universal precautions: Awareness and practice of patent medicines vendors in Enugu Metropolis, south east Nigeria. Niger Med J 2010;51:30-4. 50. Federal Ministry of Health.National strategic plan for Roll Back Malaria. FMOH, Abuja, Nigeria; 2001. 51. World Health Organization. Malaria. Fact Sheet 2013. Available from: http://www.who.int/mediacentre/factsheets/fs094/en [Last cited on 2013 Feb 6].